Need help with a weedy shoreline? Did you miss the Watershed Meeting on Monday? 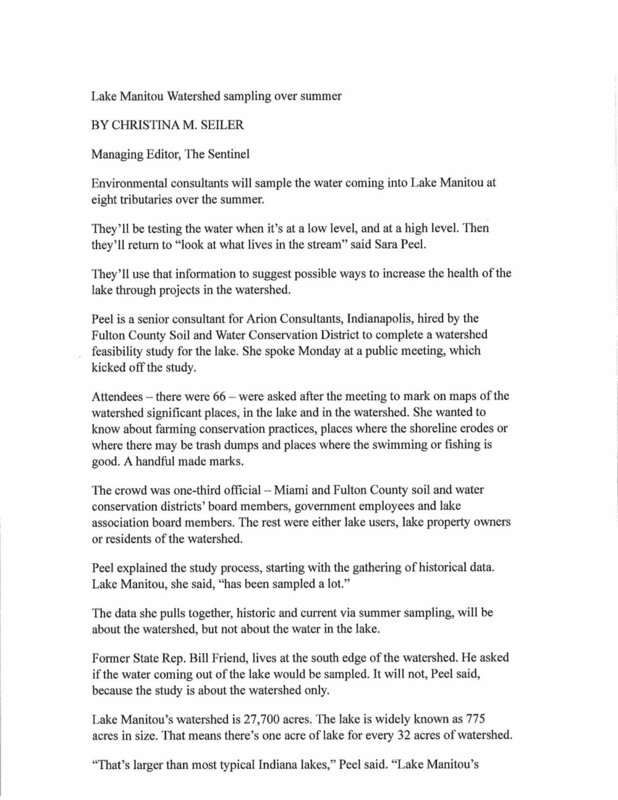 See the article from Wednesday’s Sentinel for details about the upcoming sampling. Lake Paks are available at a discount to Members. These products are applied by the property owner and can treat up to 625 sq. ft. of shoreline. Check with the DNR to confirm if a permit is necessary before treating your shoreline. See below for order form. In 2006, Lake Manitou was infested with an invasive plant species called Hydrilla. Concerned about the impact on the environment, the Indiana Department of Natural Resources chemically treated the lake for a period of 10 years, virtually wiping out all plant life in Lake Manitou. Prior to that time, the naturally shallow lake had been slowly overtaken by both native and invasive plants, making it difficult to navigate and recreationally enjoy Lake Manitou. Boats would get weeds caught in their motors, and homeowners would spend weekends raking cut weeds from their shorelines.